Participants are posing for a group photo at the closing ceremony of the 2017 Winter Ulsan Dream Camp on January 21, 2017. The second Ulsan Dream Camp, offered by UNIST finished successfully on January 21, 2017. 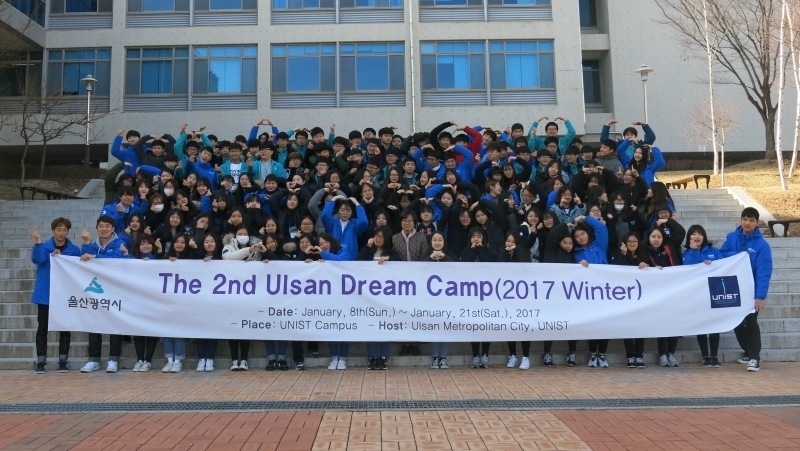 Beginning January 8 and running through to January 21, the 2017 Ulsan Dream Camp invites 105 second-year students from 37 middle schools in Ulsan, as well as 30 UNIST undergraduate students. This fourteen-day science camp is an academic enrichment program that offers students a variety of science based and recreational activities. Through one-on-one mentoring program, students also received guidance from postsecondary science students, studying at UNIST. Each mentor has met with four to five mentees, providing practical advice, encouragement, and support based on their areas of studies. During the course of the event, students received full days of exploring science, technology, engineering and math through hands-on activities, labs, games and week-long projects. In addition to one-on-one mentoring, students also had opportunities to explore the university, meet researchers, and conduct experiments in real labs. Other activities include the Golden Bell Challenge, debating competitions, a game of yut, and sport activities.